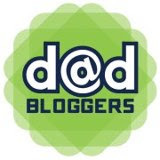 January 2014 | Daddy's in Charge? If your family is anything like mine, your kids got MORE Legos for Christmas. Just when I thought that my kids were done playing with them, along comes The Hobbit and my house is a complete mess once again. I don't think that I have ever had a clean dining room table in the nine years that I have lived in my current home. A dining room is one of those things we look for when we are buying a house with the idea that we will have family dinners there every night. What we really want the room for is a place to dump everything that we don't use anymore so the rest of our house isn't a complete disaster. THAT is where we play with Legos. I have vowed to get that room in order though. Not because I want to eat in there, but because it houses the nicest furniture that we own and I would like to see it. It's kind of crazy that we have this beautiful dining room set, and it's covered in Lego body parts. I clean that room every now and then when I know that we are getting a new batch of Legos. Usually around the holidays and birthdays I clear out space so we can go through the motions all over again. So what happens to the Legos. For the most part they get shoved in plastic bins and get put away in the closets in the basement never to be heard from again. I am starting to run out of room and am thinking about adding an extension on my home just to house the hundreds upon hundreds of mini-figures that I own. I guess I could stop buying Legos, but where is the fun in that? 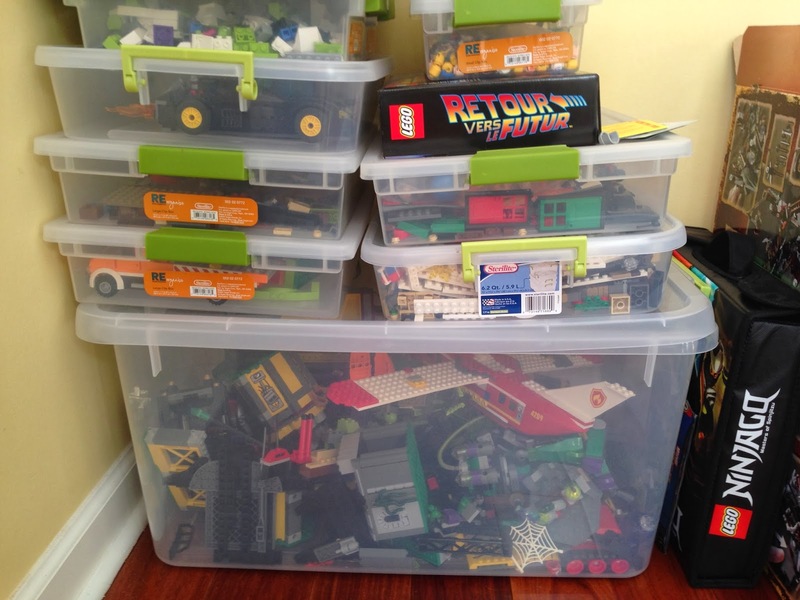 Let's be honest though, once the Legos go into a bin in the closet they get forgotten about. Nobody wants to take out one of those bins and dump it onto the floor because it's just too much of a hassle to clean up again. You can't play with them in the bin because you can't spread them out to find all the pieces that you are looking for. It's such a pain. 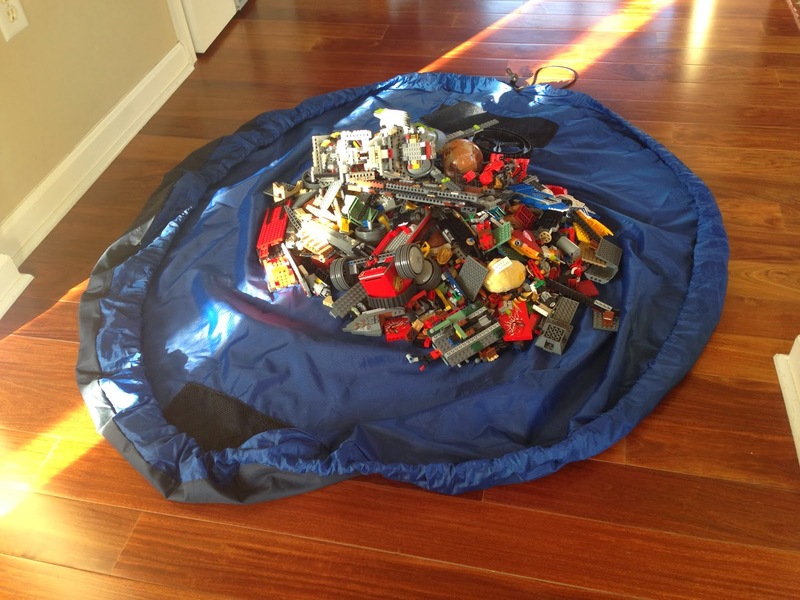 When we go to my moms house she lays a blanket on the floor and then dumps a bucket of Legos in the middle of it for the boys to play on. It's actually quite ingenious of her and it keeps the mess at bay. BUT its not the easiest thing to pack up at the end of the day and you can't really carry it anywhere so it hasn't been something that we have used at our house. I of course would need about 17 king sized blankets to store them all in. 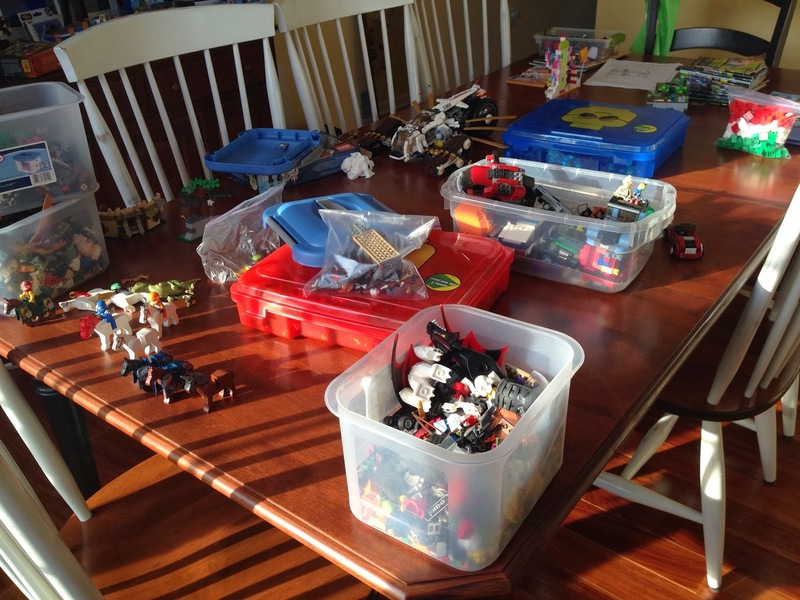 I recently found a product that I absolutely love and it solves a lot of our Lego cleanup problem and gives us easy access to play with them in the future. It's called Lay-n-Go. It takes a lot of what my mom was doing with her blanket idea but perfects it. Lay-n-Go does exactly what it sounds like it should do. You can lay it on the ground and spread it out giving you a giant mat to play on, or you can pull the draw strings together and turn it into a bag that you can go somewhere else with. It really makes the whole playing with Legos thing that much more enjoyable, because at the end of the day you can clean up your mess in a matter of seconds and take the bag wherever you want to go. The only problem with the product is that there isn't one big enough to store ALL of my Legos in. Of course there probably isn't anything that could do that anyway. The five foot wide LARGE one that I used was very capable of holding a lot of Legos. Probably as many Legos as the average person owns, but my house is anything but average. The fine people at Lay-n-Go were kind enough to let me use one of their products to try out. They have also been so generous to offer you the chance at owning one as well. Their Lite one is perfect for building a set on or carrying a bunch of action figures around, all you have to do is enter for your chance to win below. For more of their products, please check out their website layngo.com or follow them on Facebook or Twitter. 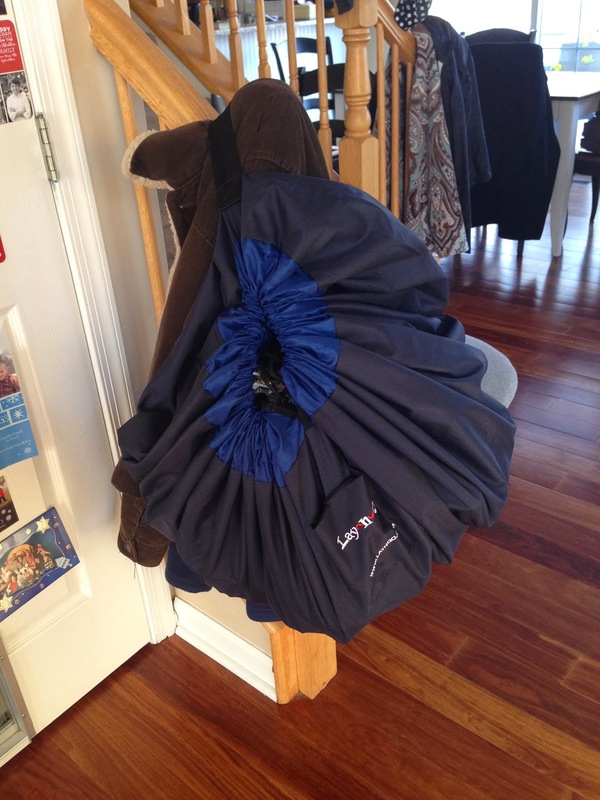 Even though I was supplied with a Lay-n-Go bag all opinions about this product are my own because it's a great. The house seems so barren now and not quite as cozy as it was the previous month. The sun shines through the living room window a little brighter now, but the nighttime darkness is what I focus on. The warm glow has been replaced by the emptiness of the outside world. It will be 11 months until we get that all back, but how much are we going to lose in the process? How much of the boys innocence and belief in magic will wane in the coming year. I can already see it, the looks of wonder and the huge smiles are being replaced by looks of indifference and non-caring grins. The truth is it all peaked a few years ago and now we just hold on to what's left. Will they even care next year? So down it comes. Packed in the basement for another year having no idea what lies ahead. Farewell oh Christmas Tree… such pleasure do you bring me.